If you have lived in Nashville for any length of time, then you know that Cheekwood has offered lots of holiday fun for many years. They have concerts, cookie decorating, gingerbread workshops, the hands down best Santa in all of Nashville (completely my opinion!) and LIVE REINDEER! 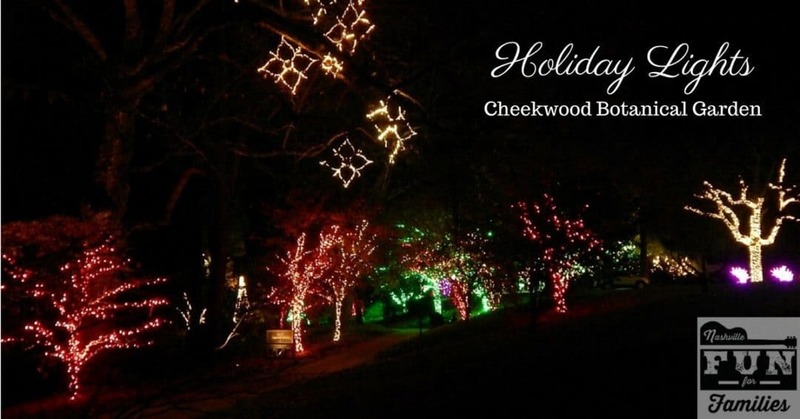 It’s basically a wonderland of Christmas fun every weekend from Thanksgiving through Christmas.And since Holiday Lights began a few years ago, Cheekwood is now a must for your Holiday family fun. Holiday Lights at Cheekwood Botanical Gardens offers fun for the whole family. You can still see Santa in his workshop and take a selfie with the live reindeer during your visit, but the lights take center stage during this attraction. Take a leisurely walk around the garden trails. Around every corner you will find light displays of different compositions. Once you make your way to the mansion, you can look over the whole garden area for the ultimate view of the lights. There are costumed carolers to entertain you with songs during your visit. Thirsty? Hot and cold drinks are available for purchase. You can also make s’mores over the fire pits near Santa’s workshop. A few tips to make your visit to Cheekwood a little more enjoyable. Dress for the weather. I know this seems obvious but sometimes fashion clouds our judgement. So cover up your holiday finery with a coat if the weather dictates and take it off quickly for photo ops. Also, consider your footwear. Yes, those high heel boots look fantastic but you will be doing a fair bit of walking so make smart choices. This also applies to your kids. If those shiny dress shoes that match the Christmas outfit make your kid wail in distress, do yourself a favor and let them wear sneakers. Don’t forget to bring a flashlight or two. Not every area of the gardens is decorated with lights so a portable light source will make the transitions much easier for your family. Make sure your phone/camera/recording device is charged and ready to go. You are going to want to take A LOT of photos. Don’t miss a magical moment due to a low battery. You’ll regret it bitterly. Holiday Lights at Cheekwood is a wonderful experience to add to your holiday calendar. Create some new Christmas memories with your family and start a tradition you can keep year after year. Admission varies from $17-22 depending on date. Tickets may be purchased online at this link. Tickets may be purchased at the gate but an additional $5 fee applies. Can you rent elecTric carts to ride aroundon. If so, how much are they and how long do you have them for?